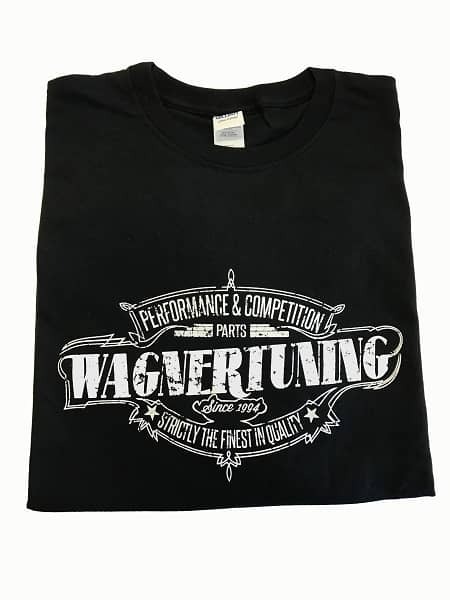 Cool Off with Summer Savings on Wagner Intercoolers and Get a Free Wagner Tuning T-Shirt with Your Purchase! 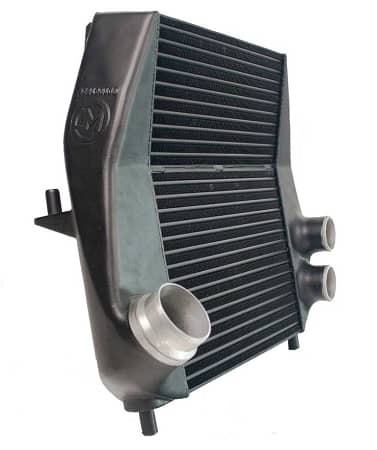 Wagner Tuning High-performance "Competition" Intercooler Core with turbolators in a unique shaped dual Core Design. Helps prevent possible condensation issue. 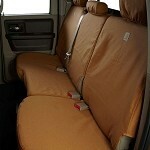 Can help to improve gas mileage. 35% bigger surface over stock unit. Lower temperatures than stock unit. 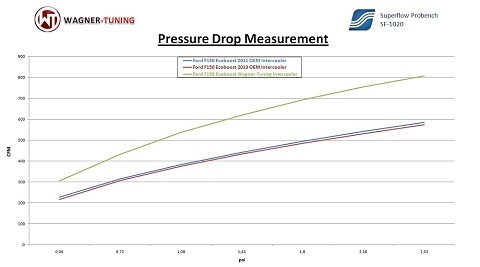 50% less pressure drop than stock unit. Helps keep a clean, 100% OEM look. Perfect for hauling and high-load situations. it provides 50% less pressure drop than the stock intercooler. should be relatively "easy", but Wagner-Tuning didn't take the easy route. With cast aluminum CAD/FEM optimized CNC machined end-tanks, a 35% increase in overall surface area, and a clean overall OEM look, this was no "easy" feat. 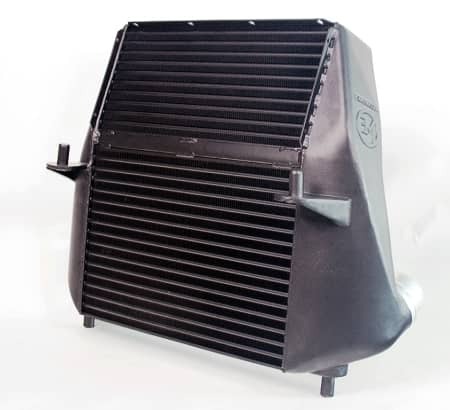 The well-thought design on the EVO intercooler included using a dual core setup, with uniquely-shaped turbulators for maximum cooling efficiency. The more surface area the turbulators provide, the better they will cool, but that also means more drag being caused. 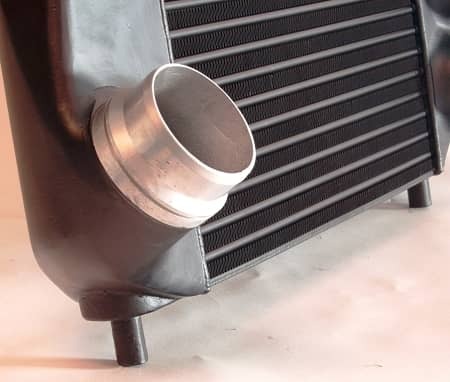 The F150 EVO Intercooler upgrade from Wagner-Tuning provides upwards of 30 degrees Celcius decrease in Outlet temps. Cutting absolutely no corners, this intercooler is without comprimse for building cold air-charge no matter what the ambient temperatures. So I punctured my factory intercooler with the air Dam. So I was losing boost and all kinds of stuff. Got the Wagner in the mail and went straight to town changing it. My old intercooler had so much oil and gas, moisture blow by it was ridiculous. This new bigger intercooler is amazing you don't bog down at higher speeds due to the increased air capacity. Makes my ecobeast scream. A tune, intake, and intercooler and my truck feels and drives like a race car. My friends have driven before and after and are blown away by the added performance. Highly recommended to any ecoboost. It takes care of the condensation issue. It's humid as hell in the arm pit of the country and this has definitely resolved it. If you can swing the price I'd get one in a heartbeat! I installed the Wagner intercooler on my 2014 F150 Ecoboost a couple weeks ago. Since then and per several data logs, the intercooler performs exactly as advertised. IAT2s under boost are WAY down as opposed to the stock intercooler. Cooler IAT2s = More timing, and more timing = More power. 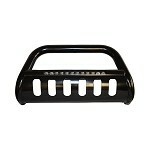 The design and construction of the Wagner intercooler is second to none. Installation was easy (although a second set of hands was pretty much necessary). Overall, I couldn't be happier with this product. I love the size of this intercooler. Was a little afraid it might be too big and cover the rad too much, but nope. Very sturdy/solid construction. The guys at MPT are awesome to deal with, so helpful with everything. And if you haven''''''''t ordered a tune yet you are missing out. These guys are the best on the market. 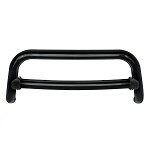 Q: On my 2012 f150 i have the RX catch can installed on the passenger side. Will this fit without causing issues? Also i guessing ill have to get my custom tune adjusted correct? 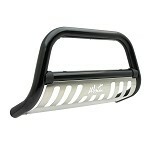 A: There should be no issue with having the catch can on the passenger side. We have one on the passanger side of our Ecobost with the Wagner intercooler. Intercoolers do not require an update to your tunes. They will work perfectly fine. 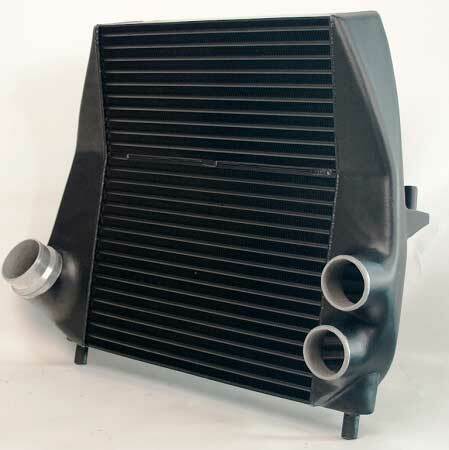 Q: Does this intercooler have the BOV mount for the 2013+ F150's? (The photos do not seem to show the mounting lug). A: When you purchase the intercooler, there is a drop down on the product page that asks what year your vehicle is, 2011-2012 or 2013-2014. This is so Wagner can set the intercooler up correctly before it is shipped out to you. 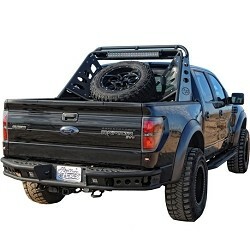 Q: What aftermarket BOV would fit, without modification, when installed on a 2013 F150 Ecoboost? The OEM Electric BOV is a tight fit. A: Any BOV designed to fit the stock intercooler should also fit the Wagner intercooler. Q: How does this fix the condensate problem? Does it have drains at the bottom? A: This intercooler does not feature a drain on the bottom. 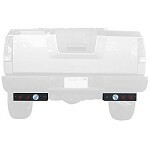 Q: Would have a drawing or dimensions for part number WAG-EVO-2000010? I'm not putting it in a truck so the dimensions are needed to see if it will fit. Thanks! A: Sorry, we do not have a diagram showing measurements of this unit, as it is designed to fit specific applications.